This weekend, we flew to Austin for a few purposes. First, a Global Entry interview at Austin-Bergstrom. Then, a full day of running around downtown Austin, ending with Valentine’s dinner at uchiko. Excellent service, and minimilist design elements abound. The restaurant was larger than I imagined, but this seems to make reservations possible. As was the case with ours, being that we only booked a couple weeks out. For Valentine’s day. With the ease of getting reservations, compared to the full fledged Uchi, these guys are making procrastination work in our favor. 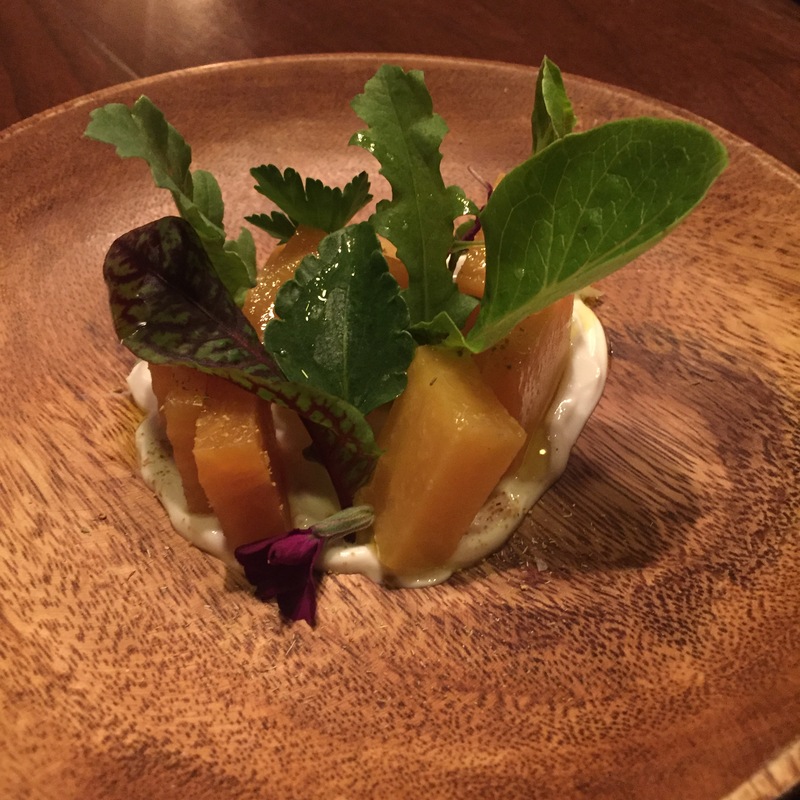 Roasted Golden Beets – Bright and tangy is the thought here. The underlying Icelandic yogurt/cheese, Skyr, drives home the point. Brussels Sprouts – Very rich and tangy. The fish caramel, lemon & chili are the perfect flavor combination. You could almost make a meal from this appetizer alone. Japanese Hot River Rock – Sear your own Waygu beef morsels to your liking. There’s kind of a dry-fondue feel to the process. Delightful. Tobacco Cream – Under two chocolate mousse-filled shells, with show-stealing, balls of actual butterscotch- smoky, peaty, real-scotch filled pearls. Unbelievable. Susuki Yaki – Grilled Mediterranean Sea Bass – Probably the best presentation of the lot, but maybe not the most earth-shatteringly delicious. It was solidly “good”. Waygu Beef – Searing on the Hot Rock. Sweet Corn Sorbet – I’m not a huge fan of corn generally, but this sweet dessert was outstanding. It utilizes several corn derivitives, including a heavy “pulverized-popcorn” dusting. All of which make for a singular-taste powerhouse.